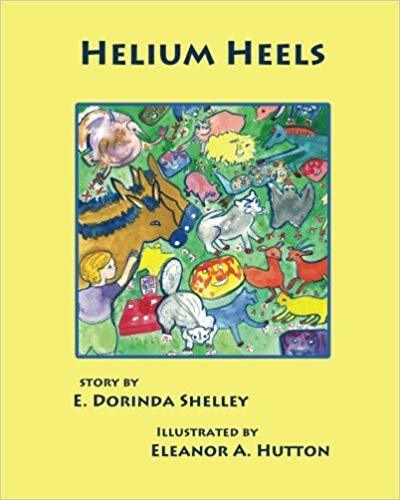 Bringing back the Little Black Hen, the ghost babies and the rest of the barnyard gang, “Helium Heels” tells a new delightful adventure filled with joy and friendship. The book’s unique plot is a fun way to spark the young ones’ imaginations as they read through this adventure. Once again, Dr. E. Dorinda Shelley brings a story that will surely be enjoyable to all her young readers. It highlights the delightful feeling of joy throughout a new adventure featuring her well-loved characters throughout the series. Along with her illustrator, Eleanor Hutton, they bring together a fun and exciting addition to her wonderful three-part creation. In the Helium Heels, readers will find Little Black Hen as she tries her very best to keep her beloved ghost babies from stirring up mischief and trouble. However, the precocious babies are out to play tricks on the sleeping donkeys. They apply red helium paint to their hooves causing the donkeys to start floating. Their prank brings mayhem to the pasture as all the farm animals dance happily around while the donkeys continue to float. Truly, Shelley’s creative and interesting story brings a delightful experience to young readers, and its unique plot is a fun way to spark their imaginations. Helium Heels is set to join the upcoming 2018 Miami Book Fair International along with the series’ first two books, The Helium Table and The Helium Egg on November 11-18, 2018. Regarded as the nation’s finest literary festival, this surely is an affair that should not be missed! Dr. Shelley is a retired dermatologist. She grew up in Missouri, spending weekends on a farm with friendly horses. She, her husband, and three children lived for many years on a “farmette” in NW Ohio, surrounded by many of the animals in this story. This is the third in a series of books she has written and Eleanor Hutton has illustrated.